Fisherman's Island State Park is not an island but is a beautiful park with more than 2,600 acres and five miles of gorgeous Lake Michigan beach. A tiny island just off shore of the picnic area gives the park its name. 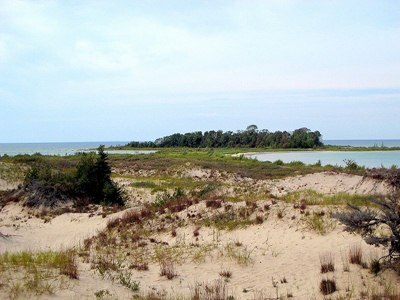 Located just south of Charlevoix, Fisherman's Island State Park features a 81-site rustic campground with some of the camping sites nestled in the dunes along Lake Michigan. The park road travels through the campground to the picnic area along the beach. The three-mile long hiking trail travels through rolling dunes covered with maple, birch and aspen and cedar and black spruce bogs. Cross country skiing, snowshoeing, hunting, swimming, camping, and picnicking are available at Fisherman's Island State Park. 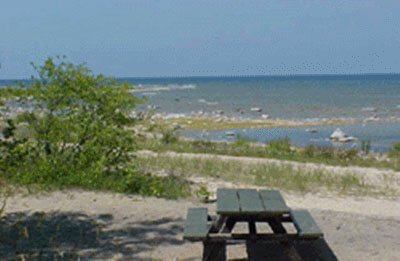 This state park in open from mid-May to mid-November just a few mile south of Charlevoix. Charlevoix is Lined with Petunias!